Plyometrics are a type of exercise designed to produce fast powerful movements, generally for the purpose of improving performance in a sport. A Plyometric movement is one in which a muscle is extended and rapidly contracted again. The purpose of this is to jump higher, run faster, throw further, hit harder, etc. Before performing Plyometric exercises, there are some things you should try to bear in mind though. The rule of thumb is those who are unable to lift 75% of their body weight in the three major lifts (bench, squat and dead lift) should consider training further to increase their strength before attempting plyometric exercises. Also make sure you are in good health before attempting this type of exercise. An example of a Plyometric exercises would be Plyo Push Ups – Here you will focus on throwing yourself as high into the air possible from the “down push up” positions. A good example of this is the “clapping push up” where you are forced to push your body at least 6-8 inches further off the ground than normal to perform the “hand clap”. 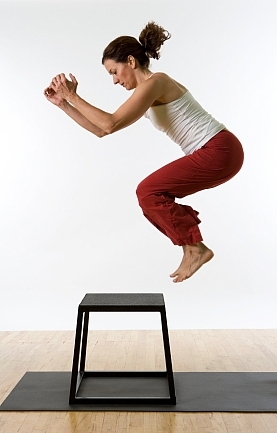 Plyometrics are a VERY effective workout for developing both speed and strength. Some professional athletes use plyometics as their only source of training, but i found it more effective if used as part of a more rounded workout routine. There is little doubt that if you incorporate some plyometric exercises into your regular workouts, you too will experience excellent speed and strength gains by using this type of exercises. Finally – Plyometric exercise routines are like any other exercise routines – You will get much better results if you take the time to warm up properly beforehand, and cool down properly afterwards. Perhaps more importantly then that, you’ll also greatly reduce your risk of picking up an injury during your workouts. Dave is better known to everyone as ScotBoxer and I’m an ex-boxer and “minder”. As the nickname suggests, I’m a proud Scot who still lives in the beautiful city of Edinburgh.